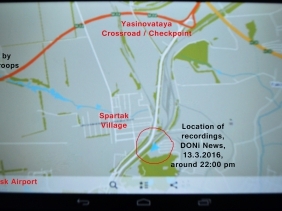 Late evening and night yesterday on Sunday 13.03. the outskirts of Donetsk city were under intense attacks by the Ukrainian troops, as were the most remarkable sectors at the same time: the Airport, Spartak and the Yasinovataya crossroads. The DONi News team recorded sounds from battles close to the frontline for you to understand the real gravity of the situation in the DPR defense lines today. We positioned our car just behind the Spartak village which has constantly been under Ukrainian shelling and attacks especially in recent months. From our observing position we could cover three of the main sectors - Spartak, the Donetsk Airport on our left and the Yasinovataya crossroads on our right side. All these three sectors were under attack at the same time between 22:00 and 23:00 local time, when we were doing our observations and we also confirm this by checking the situation in each sector closer. In this audio-video clip there are two tapes from the situation and how it can be heard in the middle of darkness. We have to remember that in front of us, a few hundred meters from the position where these tapes are recorded, there are approximately 800 civilians, women and children, still living in horrible conditions. They stay in cellars and bomb shelters in the middle of the shelling and under fire from automatic weapons. DONi News will keep closely covering situations in hotspots, and the military intelligence sources are telling us that Ukraine keeps sending heavy artillery and rocket launchers to further escalate the situation. We can already hear them shelling, day and night, outskirts of the DPR capital. Since the beginning of March the general situation has been worsening day by day, and surely this was the first time we could observe three frontline sectors in defensive battles simultaneously.